1. Preheat your grill to maximum and bring a saucepan of water to the boil. 2. Line your grill tray with a piece of baking parchment and lay the sea bass fillets, skin side up on to the paper. Cut the cherry tomatoes on the vine into 2 with 4 tomatoes on each and place upside down next to the sea bass fillets. Drizzle both the fish and the tomatoes with the olive oil and sprinkle generously with salt. 3. Slide the tray under the hot grill and cook for 3 minutes. After 3 minutes flip the tomatoes over, but leave the fish to continue cooking skin-side up. Grill the ingredients for a further 3 minutes, by which time the fish skin will have browned and blistered in spots, but be perfectly cooked through and still juicy on the flesh side. 4. When the water is boiling, add the tagliatelle and bring the water back up to the boil. Simmer the pasta for 4 minutes before draining through a colander. Tip the pasta back into the cooking pan and add the pesto and walnuts and season generously. Mix well so that the pasta is coated with the pesto. 5. 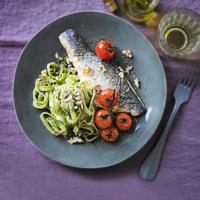 Divide the dressed pasta between 2 plates, lay the fish beside it and crown with the grilled tomatoes. Finish by drizzling a little extra pesto on top of the fish and tomatoes.